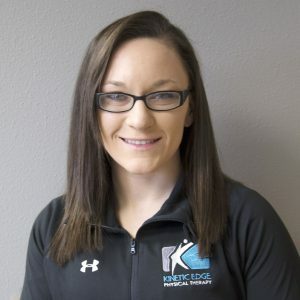 Kinetic Edge Physical Therapy is proud to announce the addition of Kaity Hall, as their newest Des Moines Physical Therapist who is now accepting new patients. Kaity’s mission is to serve clients by looking at them as a whole and providing functional treatments, in addition to promoting overall health and wellness. She has a passion for functional treatment and regularly uses a Gary Gray functional movement analysis and treatment approach. Kaity earned her Doctorate in Physical Therapy from Des Moines University. She earned her Bachelor’s degree in Athletic Training from UNI. Kaity and her husband, Austin, reside in Urbandale. In her free time, she enjoys being outdoors, going to the Farmer’s Market, cooking, and exercising. Kaity is excited to restore health, happiness, and hope. Schedule an appointment or contact her by calling 515-309-4706. Kinetic Edge Physical Therapy’s mission is to transform lives and restore hope through movement. They envision communities of healthy, happy, and hope-filled people and work towards that through the services they provide. Kinetic Edge has clinics in Pella, Des Moines, Oskaloosa, Newton, and Ames and consults throughout the state of Iowa and beyond. Their services include physical therapy, occupational therapy, worker performance, athletic training, pediatric therapy, and medical fitness.